Wouldn’t it be easier if minicabs were more accessible? Wouldn’t it be better if minicab drivers were more helpful and patient? If you’ve ever thought that there should be a car service that really meets your needs – then YourCar could be just what you’ve been looking for. YourCar is a membership scheme that provides you with a low-cost, accessible alternative to using minicabs and taxis. It has been designed specifically to support people who might have difficulty using public transport and where taxis and regular minicabs don’t meet all of your needs. If you have difficulty using public transport and taxis and regular minicabs don’t meet all of your needs – then YourCar could be the answer. Affordable: You will find YourCar’s rates are highly competitive in comparison to traditional minicab hire – and we always quote a price at the time of your booking so there are no surprises. Understanding: YourCar drivers have been specifically trained to help people who might need more support, patience and understanding when they make their journey. 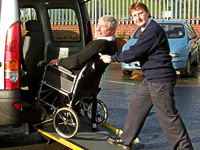 Accessible: YourCar uses the very latest fully accessible vehicles to ensure that everyone can get out and about – including wheelchair users. Safe: For your peace of mind, all YourCar drivers have passed a CRB police check. Reliable: We’ll always try to get to you on time – and we’ll never tell you that we are ‘just five minutes away’ unless it is true. We are not taking on new members, at present. Please continue to visit the website for further updates. After that, you simply call the booking hotline - 020 7275 2402 - during office hours, let us know when you need to travel, where you are going and if anyone else will be travelling with you. Our friendly and helpful staff will quote you an exact price for your journey based on the information you have provided. If you prefer, you can also request a booking online. YourCar will arrive at the appointed time and away you go. As a member, you can be sure that we’ll always send a vehicle and trained driver that meets your individual needs and requirements. At the end of the journey, simply pay the driver the quoted fare – just like a regular minicab. If you would like to find out the exact price for a journey that you are thinking of taking, please call us on 020 7275 2402. You can join YourCar if you live in Hackney, Haringey or Islington – but the service itself can take you anywhere you like. We’d really like to know what you think about our YourCar service – It would be very helpful if you could complete our short online survey by clicking here.